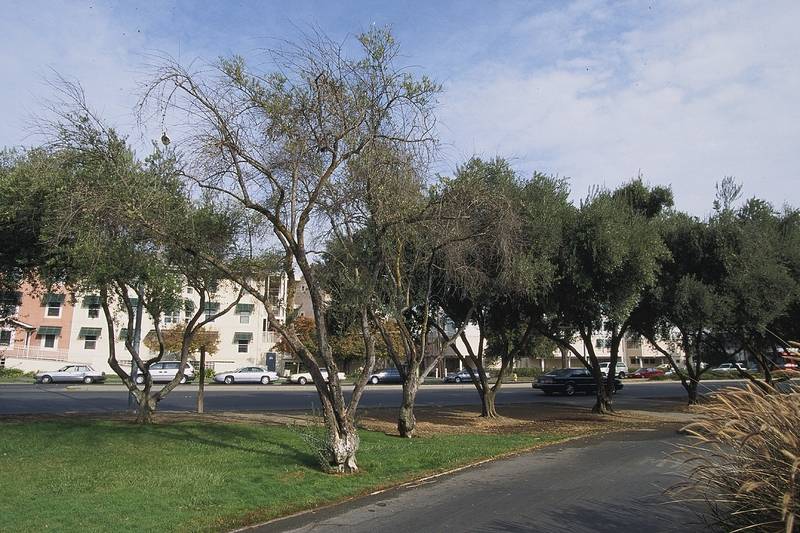 Most disorders impacting landscape trees result from abiotic (non-living) disorders rather than attacks from biotic (living) pests like plant pathogens, insects, and vertebrates. Damage caused by abiotic and biotic disorders can appear similar, making diagnosis difficult at times. For example, discolored leaves on a Ficus nitida tree could be due to drought stress, a fungus, or a nutrient toxicity or deficiency. In some cases, biotic injury may be obvious and abiotic disorders can be ruled out. For instance, many insects and diseases are often restricted to a single plant species and will not affect multiple plant species in the area. To determine if damage is the result of an abiotic disorder, look at the landscape as a whole. Are symptoms exhibited by a single plant species or by a wide array of species? Usually, uniform damage to multiple species within a limited area of the landscape signifies one or more abiotic factors are to blame. Below are several common landscape disorders encountered around home landscapes and ways to prevent them or remedy problems once they occur. Providing inadequate water can adversely impact plants until they are established, even drought resistant species. Outbreaks of insect pests, such as certain bark beetles, can quickly infest stressed, water-deficient trees. Because drought-stressed trees cannot recover from wounds as quickly as healthy trees, pathogens causing several canker diseases are often common during and just after drought. However, many established landscape plants suffer from too much water rather than not enough water (Figure 1). As woody plants age, they prefer to be irrigated more deeply and less often than when initially planted. Heat stress often occurs when a tree is planted in a climate zone with higher summer temperatures than those to which the tree is adapted. Over time, high air and soil temperatures can lead to irreversible damage. In some cases, trees well adapted to inland or desert climates can become stressed and die under temperatures they would normally endure if a water deficit develops. You can access the American Horticultural Society (AHS) heat zone map information (based on the number of days with temperatures above 86°F) to find the heat zone in your area. Many nurseries now include this information on plant tags. Mechanical injury, like damage from tight, unremoved staking ties (Figure 2), can extend into the vascular system of plants, cutting off the flow of water and nutrients. Early symptoms include wilting, stunting, and general decline. Bark can also be damaged from mowers and weed trimmers. 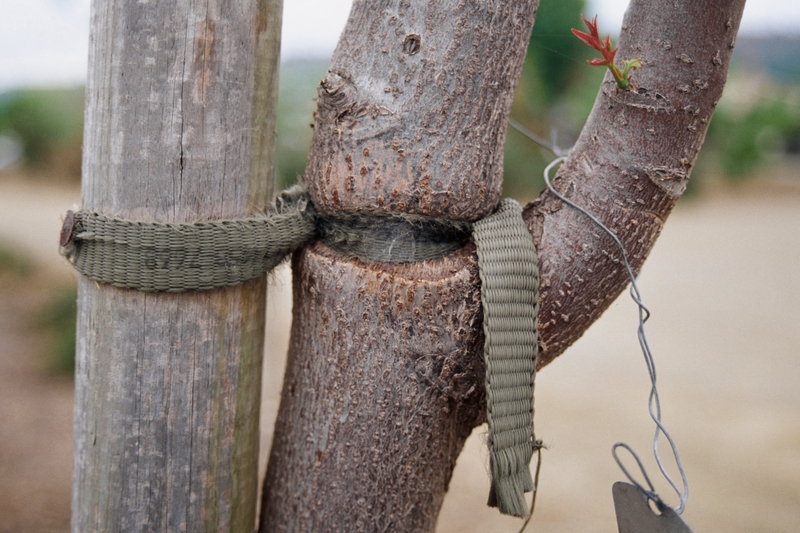 Advise customers to avoid trunk injury since damaged bark cannot be repaired. Excessive applications of fertilizers and irrigation with water high in certain ions can result in salt toxicity. 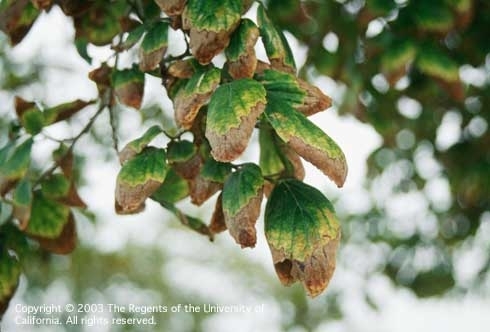 Damage appears as marginal leaf browning, leaf scorch, stunting, or chlorosis (Figure 3). Another visual sign of salt build-up is the presence of a white or black crust on the soil surface. Salt damage can result in injury and even death, of sensitive plants. Trees do not require nutrients immediately after transplanting because they store food reserves in roots. With landscapes increasingly being irrigated with recycled water, leaching needs to be a routine component of maintenance. Saline soils can be remedied by leaching salts below the root zone with large amounts of fresh water (the original source of saline water cannot be used for this). In some cases, when the irrigation water is more saline than most plants will tolerate, less sensitive species should be selected. Prevent abiotic disorders by selecting healthy plants well suited to the climate and microclimate, incorporating recommended planting techniques, providing a soil environment that optimizes healthy root systems, and implementing sound cultural management practices (such as irrigation, fertilization, pruning, and aeration). This article was modified from a previously published article from the Winter 2017 issue of UC IPM's Green Bulletin (Vol. 7, No. 2). For more comprehensive information about abiotic issues, refer to the UC ANR publication, Abiotic Disorders of Landscape Plants: A Diagnostic Guide.